We all have our fascinations. Some of us are enamored of a particular historical era. If I had to pick a time period I’d want to visit, I’d say the 1930s—after the Depression, before World War II—a “tweener” decade if there ever was one. Jo Hedwig Teeuwisse takes her interest in the 1930s to extraordinary lengths. She wears vintage clothing and attends 1930s-theme parties. She is also a historical consultant and expert on daily life from 1930-1945. Teeuwisse lives in The Hague but once, while visiting Amsterdam, she stumbled upon a treasure on the street. It was a box filled with old photographic negatives. Some had identifying notes but most did not. A history nut, Teeuwisse went to work immediately trying to sort out where the shots were taken and, if possible, the identities of people in the retro photos. 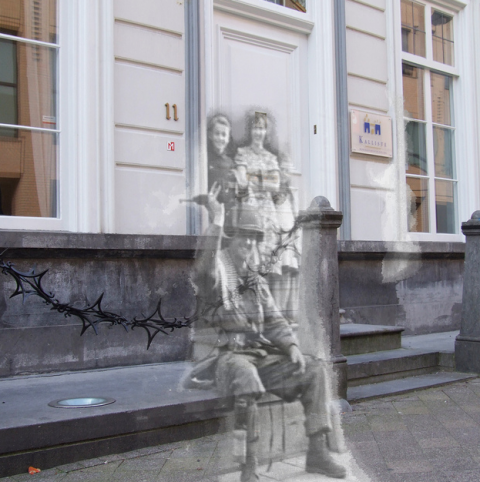 The results are an impressive and amazing archive Teeuwisse calls Ghosts of History. 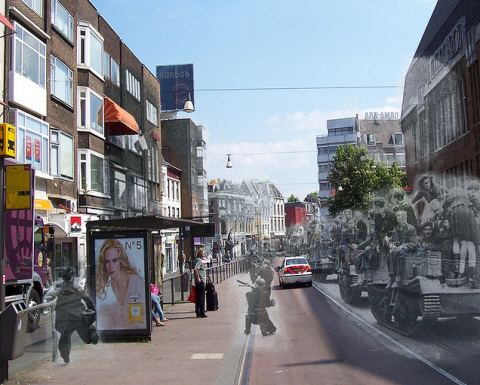 More than simply figuring out which building is featured in a picture, Teeuwisse created photo mash-ups by combining elements of a vintage image with an image of her own taken in the same place today. We see members of the underground press marching down a main Amsterdam thoroughfare in June, 1945 alongside shoppers and tourists strolling down the same street today. In a powerful juxtaposition of then and now, three Dutch scouts risk their lives crossing Amsterdam’s Dam Square in the aftermath of a Nazi attack just two days after Germany surrendered. Note the hats left behind by people who had fled for their lives, and the contemporary students walking nonchalantly on. This image shows the same scene, but with the Nazi recruitment office sign prominent in the background. What is so potent about Teeuwisse’s work is that it is so quiet. She doesn’t have to point out irony because it is so immediately evident: Those same cobbles that so many have trod on the way to Madame Tussaud’s Wax Museum are scuffed by the boots of soldiers, famished victims of war austerity and ordinary working people on their way to the factory. Some make it more plain than others that history is all around us all the time. There are still many World War II images from that box that remain unidentified. Teeuwisse loaded them all up to her flickr site. Take a look. Maybe you’ll find a familiar face from your own past. Shimon Attie has been doing this sort of thing for many years now. He has done some installations in Amsterdam. His work deals with absence and memory. He has projected images of Jews onto the homes and buildings they once occupied before WWII.